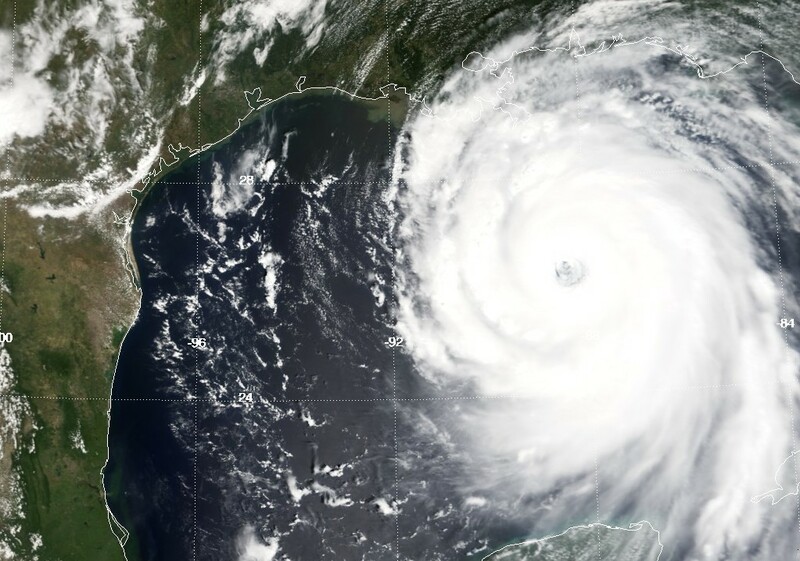 Marking a sad anniversary today: it’s been 5 years since Hurricane Katrina churned through the Gulf as a Category 5 monster, pounded communities in Louisiana and Mississippi, and overwhelmed New Orleans. The human tragedy was appalling. The environmental news, at first downplayed by government officials (and to this day misrepresented by some offshore drilling proponents), wasn’t very good either. 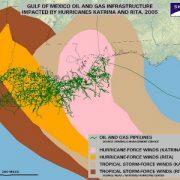 MODIS satellite image shows Hurricane Katrina hitting offshore oil and gas fields with Category 5 strength on August 28, 2005. Just a few weeks later, Hurricane Rita ripped through the Gulf. 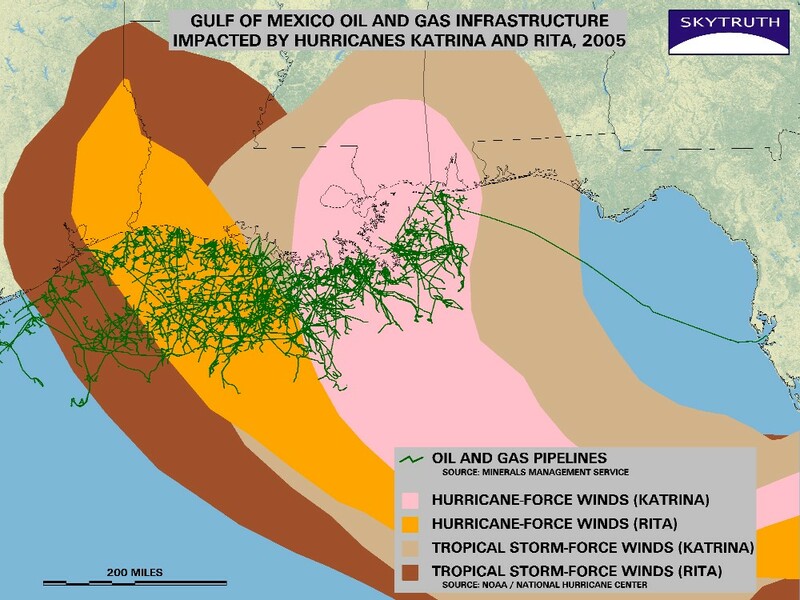 Together these two storms wreaked havoc on coastal and offshore oil and gas facilities. According to that agency formerly known as the Minerals Management Service, and the US Coast Guard, over 1oo offshore platforms were totally destroyed; more than 450 breaks were reported in seafloor pipelines; and, all told, more than 9 million gallons of oil spilled from damaged offshore and coastal infrastructure. Map showing offshore oil and gas infrastructure (pipelines in green) directly affected by Hurricanes Katrina and Rita in August-September 2005. Six weeks after Rita, that tally was greatly increased when the barge T/B DBL 152 struck the unmarked ruins of an offshore oil platform that Rita had demolished. The barge was loaded with more than 5 million gallons of “slurry oil,” a heavy residual product of the gasoline-refining process that is often used for fuel oil. The crippled barge became grounded in shallow water, then capsized, dumping almost 2 million gallons that settled on the seafloor. Only 5% of this oil was recovered. Scientists at Woods Hole announced their discovery and detailed mapping of a large underwater plume of finely dispersed oil from the BP spill. Measuring 35 km long x 2 km wide x 200 m thick, it was about 900 meters (3,000 feet) below the surface and drifting slowly southwest from the leaking Macondo well. The team was tracking this plume in late June, up until Hurricane Alex chased them back to shore. The researchers said it appeared to be breaking down and dissipating much more slowly than expected, probably because of the very low water temperature at that depth. The combined concentration of several key indicator hydrocarbons (benzene, toluene, ethylbenzene, and total xylenes) in the plume was at least 50 micrograms (millionths of a gram) per liter. That’s very dilute, although it may have some toxic effects. the total amount of petroleum hydrocarbons in the plume and the full extent of possible risks to marine biota remain uncertain. Scientists vehemently disagreed with the brief report issued by the federal government on August 4 that some interpreted as evidence that most of the oil spilled from BP’s Macondo well was…gone. Researchers at the University of Georgia issued their own report yesterday, claiming that nearly 80% of the oil spilled remains in the ecosystem, subject to evaporation and biodegradation but at unknown rates, meanwhile doing damage in a variety of different ways. And natural gas, mostly methane, was released in great quantities during this spill. Some scientists have estimated that as much as 40% of the flow from the Macondo well was natural gas, mostly methane (CH4) that dissolved rather than floating to the surface and escaping into the atmosphere. At 80 cubic meters of methane per barrel of oil, with a total spill of 4.1 million barrels (172 million gallons) of oil, we calculate 328 million cubic meters – 11.6 billion cubic feet (BCF) – of methane were injected into the Gulf. Researchers from Texas A&M University, the University of Georgia, and the University of California – Santa Barbara have measured levels of dissolved methane thousands of times above normal, thousands of feet below the surface. The microbial degradation of methane will consume oxygen from the water, possibly slowing biodegradation of the oil, particularly at deeper levels, and leading to the formation of additional oxygen-deficient dead zones devoid of fish, marine mammals, and much of the typical Gulf fauna. The Unified Command has made no mention of this gas, but it should not be ignored. Because the discharge occurred at 5000 ft depth, all the material rising toward the surface or drifting in subsurface plumes is in the ocean for hours, days, or months and can have a significant chemical and biological effect. So the hydrocarbon gas meets the OPA definition of “discharged.” The hydrocarbon gas is highly soluble in the deep, cold waters of the Gulf. Based on previous measurements, much of the gas released at depth will dissolve before it reaches the surface. Microbes degrading this material will compete for nutrients (like oxygen) with those attacking oil and will significantly affect the overall degradation process held to be so important by NOAA and DOI. Fish exposed to concentrated methane have exhibited mortality and neurological damage. The hydrocarbon gas was a major component of the total pollution load discharged from the BP well. We just learned that the Cotter Corporation has decided not to re-open it’s uranium mill near Canon City. While it was operating this plant contaminated soil and groundwater so severely that in 1984 it was designated a Superfund toxic-waste site. 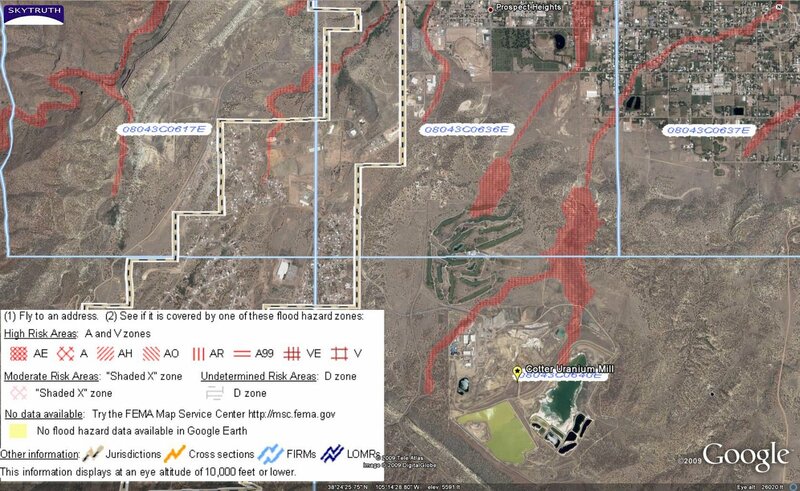 Cleanup to remediate high levels of uranium and molybdenum has lagged, and SkyTruth images show that parts of the site actually overlap with areas that FEMA has designated high-risk flood zones — some leading right into adjacent residential neighborghoods. Keeping the mill shuttered may be a relief for some local residents, but it comes with a catch: Cotter has notified the state that it will no longer conduct routine monitoring for buildup of dangerous, heavier-than-air radon gas, a breakdown product of the uranium. And government officials are wondering, if Cotter runs out of cash, who will foot the bill for the complex and expensive cleanup to protect public health. 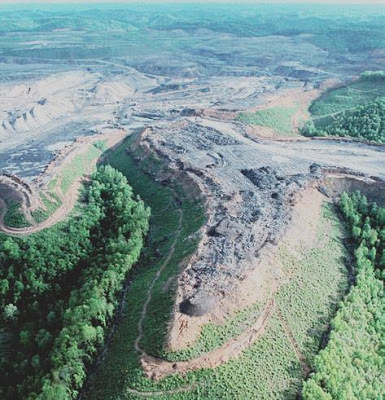 It’s official: strip-mining for coal using the massively disruptive process known as “mountaintop removal” definitively pollutes streams and rivers. directly link changes in the stream water chemistry to the area of the watersheds that has been disturbed by mining activities. How did the team determine the area of the watersheds that was impacted by mining? Glad you asked: SkyTruth’s work provided a key component of this study. Our satellite image analysis of surface mining impacts throughout Appalachia from the 1970s through the 2000s gave researchers the spatial and temporal information they needed to correlate mining activity with water-quality measurements. Now we have a predictive tool, a way to forecast the water-quality impacts of proposed new mining activity. This may mean mining companies need to figure out ways to better protect water quality if they hope to get new mining permits approved. That’s good news for aquatic creatures, and great news for those of us humans living downstream who drink this water every day.